Bibby Distribution has successfully reduced its carbon footprint for a fifth consecutive year thanks to its expanded sustainability strategy. Continued investment in new, cleaner and more energy-efficient fleet assets and facilities has seen the 3PL drive down emissions as part of its Road to Zero policy. “Our commitment to the environment and ethical business practices sits at the core of our business. We want zero harm, zero waste and zero environmental impact,” said Andrew Mawson, Bibby Distribution’s Head of Safety, Health, Environment and Quality (SHEQ). “Our strong sustainability strategy has played a role in us securing major contract renewals. We are proud of what we have achieved so far and are committed to going even further to improve in other areas – such as increased recycling, a reduction in waste going to landfill and researching and implementing renewable energy options,” he added. Since 2014, Bibby Distribution reduced the average amount of CO2 produced per vehicle by 14% due to the ongoing use of longer semi-trailers, higher triple deck trailers and remould tyres, while every company site has now an appointed ‘sustainability champion’ that implements more efficient working practices. Moreover, the introduction of ultra-efficient smart LED lighting at the company’s newest sites in Bury, Corby and Wakefield, as well as retrofitting the system at its Avonmouth facility, has cut lighting energy use by around 70%. Electric materials handling equipment is also standard at all new facilities, while at Bibby Distribution’s newest site at Corby, electricity is supplied on an approved Green Tariff, saving 133 tonnes of CO2 each year. “Our sustainability strategy has seen us continue to update and upgrade our distribution fleet, and we are on course to have 95% of our vehicles Euro VI compliant by the end of 2018. We have also expanded into new, more sustainable distribution sites, which has contributed to an overall reduction of CO2 emissions per square foot of warehouse space by almost a fifth year-on-year,” said Andrew. 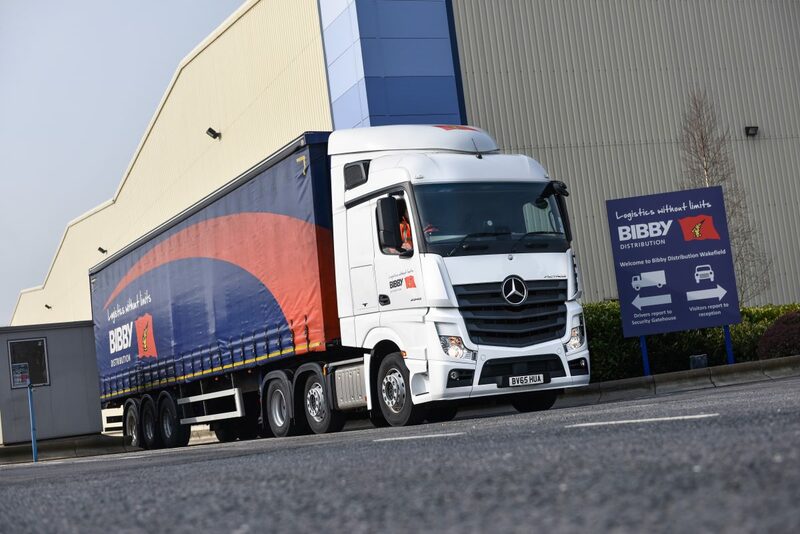 Bibby Distribution will continue on its Road to Zero by retrofitting LED lighting at its Scunthorpe and Biggleswade sites by the end of the year and reducing its fleet carbon emissions further through driver training, telematics, investment in alternative fuels and vehicle innovation. The company aims to have its entire fleet Euro VI compliant by 2020.